The most important part of a job interview is the beginning. That’s when you have an opportunity to make a great impression—or a poor one—on your interviewer. Some say they know within the first 30 seconds or so whether the person has a shot at getting hired. You probably have a little more time than that, but it’s important to make the best impression you can within the first few minutes of meeting your interviewer. Carry it on throughout the interview, so you have a good shot at getting a second interview and a job offer. Here are some quick and easy tips on how to impress all the people you meet when you’re interviewing for a new job. 1. Practice. Practice might not make perfect, but it does help you make a good impression. Review the interview questions that employers most frequently ask and think about how you’ll answer them. 2. Wear appropriate interview attire. It can be really awkward if you show up at a job interview overdressed—or underdressed. Always dress appropriately for an interview so you make the best first impression. 3. Don’t go into the interview without knowing anything. Take the time to research the organization, so you know as much as possible about it. That way you’ll be prepared to answer questions about what you know about the company. 4. Get the inside scoop. Besides researching the organization, see if you can get some inside information on the company and its employees. Check LinkedIn, Facebook, and your college alumni network to see if you know anyone who can share insider information with you. 5. Review the job posting. Know as much as you can about the job. Review the job posting and know what the employer is looking for in the person they hire. Also, take a look at your cover letter and resume, so you are clear about what you can offer the employer. 6. Check out the interviewer on LinkedIn. Take a minute or two and check out the interviewer on LinkedIn if you can find them. That will give you a sense of the person you’ll be meeting with, as well as their career path and tenure with the company. 7. Go light, very light, on the perfume or cologne. That boss I mentioned didn’t like smelling perfume so if someone overdid it, they could knock themselves out of contention before they even shook his hand. 8. Avoid sweaty palms. Nobody wants to touch a slimy wet hand. If you can visit the restroom on the way to the interview, wash and thoroughly dry your hands. When that’s not possible, use a tissue to make sure your hands are dry. 9. Take a deep breath. Then another one. Interviews can be really stressful. While you’re in the restroom, take a few deep breaths and remember that you’re here because you were chosen to interview. 10. Have a good handshake. When you are greeted by the interviewer, offer to shake hands and introduce yourself to get the interview off on the right foot. 11. Smile. 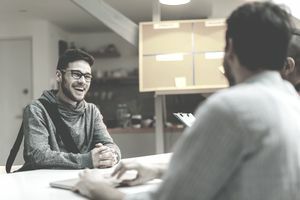 You don’t want to overdo it, but think positive and smile when you’re meeting the interviewer and when it’s appropriate during the interview. Positive people with strong interpersonal skills are more likely to be hired. 12. Show your enthusiasm. On a related note, show your enthusiasm and passion for what you do and what you’d like to do in your next job. It’s fine to let the interviewer know that you love your work and are excited about this opportunity. 13. Share how you’re a great fit for the job. Back up your enthusiasm with facts. It’s not enough to say that you’ve got the right stuff for the job. Be specific and show the employer why and how you’re qualified. 14. Don’t panic. Even if you’ve done all the right prep work, you can be taken off guard by an interview question that you weren’t expecting. Prepare for the worst, so you don’t have to panic. 15. Share a story or two. Don’t just state your qualifications. Instead, use your storytelling skills to share examples of what you have achieved at work. There’s nothing better than a real-life story to engage your interviewer and show what you can do. Follow up after the interview. A final way to make the best impression and show you care about this opportunity is to follow up with an email message, note or phone call. In addition to relaying your thanks for the interview, reiterate why you’re a terrific candidate for the job.